For those of you that haven't heard, Homewood Resort (West Shore) wants to make major upgrades to their Base and Mid-Mountain areas. Their most recent master plan submission (Oct. 2011) includes Base improvements of a new lodge, hotel, condos, restaurant, parking structure, grocery store, hardware store and ice rink. 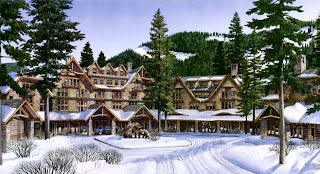 Mid-Mountain upgrades include a new lodge, gondola terminal, ski lift, outdoor pool and maintenance facilities. This is an ambitious plan that will totally change the look of Homewood and the surrounding neighborhood. The next meeting to voice your concerns or support is scheduled for December 14th, at the Tahoe Regional Planning Agency Governing Board at 9:30am, Granlibakken, Tahoe City. Homewood is currently closed (lack of snow) with lift prices "TBD".